An image of Beyonce and Jay-Z is projected before they appear to perform on stage during the 'On the Run II' Tour at Hampden Park on June 9, 2018 in Glasgow, Scotland. Beyoncé and Jay-Z just dropped new music as they continue their "On the Run II" tour. 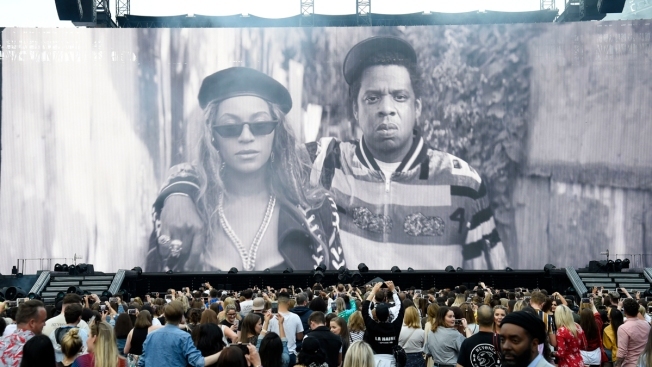 The two on Saturday released on Tidal their first joint album, the nine-track record "Everything Is Love," and a music video for its single "Apes**t."
The footage shows Bey and Jay at the Louvre museum in Paris, including shots of them standing in front of the Mona Lisa painting while wearing pink and mint suits as well as shots of dancers performing in skin-colored tights and crop tops. Two performers appear on the cover of the "Everything Is Love" album. The video was filmed on location last month, a Tidal rep told E! News. Beyonce sings and raps in the song "Apes**t." Sample lyrics include, "I can't believe we made it / This is why we're thankful" and "Have you ever seen a crowd going apes**t?" The couple announced their surprise "Everything Is Love" album at their concert in London. Jay-Z had Beyonce have collaborated on other songs in the past but never on a full album. He told the New York Times in 2017 that the two both "using our art almost like a therapy session" when they had marital problems—which ultimately resulted in her Lemonade alum and his 4:44 album. "And we started making music together. And then the music she was making at that time was further along. So her album came out as opposed to the joint album that we were working on," Jay-Z said.